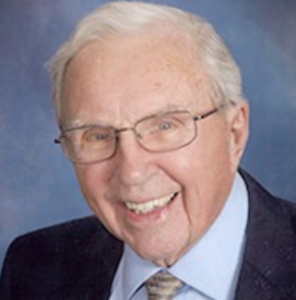 MARINE ON ST. CROIX, MN (November 15, 2018) – Retired Covenant minister Wallace (Wally) Pratt died Friday, November 9. He was 91. Wally was born November 12, 1926, in Minneapolis to Lawrence and Alice Pratt. He served in WWII before returning to attend college. He graduated with a Bachelor of Arts degree from Augsburg College. He studied for a year at Luther Seminary and then attended and graduated from North Park Theological Seminary. Wally married Lorraine Bjorklund on March 19, 1948. The couple served multiple Covenant congregations. Survivors include his wife; two daughters, Joyce Carlson (Tom) and Sharon Lee (Dan); three sons, Len (Ellen), Lowell (Wendy), and Warren (Lisa); 13 grandchildren and 13 great-grandchildren. He was preceded in death by a granddaughter, Annamarie Carlson. A celebration of life service will be held at 4 p.m. on Friday, November 16, at Salem Covenant Church in New Brighton, Minnesota. Visitation will be an hour before. Private interment at Hillside Cemetery. Memorials are requested to be sent to the church: Salem Covenant Church, 2655 5th Street NW, New Brighton, MN 55112. Big Q: When did a total stranger do something kind for you?